The mediation clinic consists of two courses, Mediation I and Mediation II. Mediation I is a general civil mediation training that is approved by the Georgia Office of Dispute Resolution. 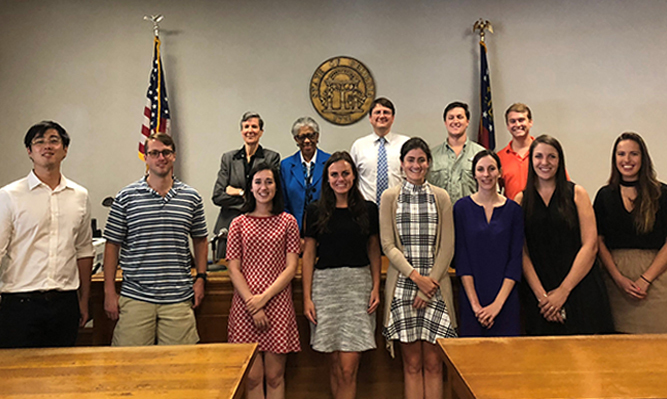 Students who complete all of the requirements are eligible to register with the Georgia Office of Dispute Resolution and, once registered, mediate court-referred cases in Georgia. Successful completion of Mediation I (or prior registration and the permission of the instructor) is required for students desiring to take Mediation II. Mediation II is a clinical experience where students mediate on-site for the Athens Clarke-County Magistrate Court. Mediation skills are useful to almost any area of law practice. In learning to mediate students also learn how to communicate effectively, think creatively, negotiate using integrative bargaining principles, and how to draft clear and enforceable settlement agreements. What is required for Mediation I? Mediation 1 is a three hour, three credit course that meets weekly. It is a highly participatory course, and therefore class attendance and participation are extremely important. Missed classes must be approved by the instructor, and may result in failure to meet requirements for ODR registration. The course may be taken for a grade without registration with the Georgia Office of Dispute Resolution, in which case class attendance for each class is not mandatory. Is there a writing requirement for Mediation I? There is very little out of class work involved in Mediation I, hence class participation is critical to your grade and to becoming a competent and ethical mediator. Some reading and out of class preparation is required, but the bulk of your work and learning will be done in class. There is a final exam that is performance based and involves participating in mediation simulations similar to the role plays performed in class. Typically the exam is administered during the last class rather than during exam period. How do I enroll in Mediation I? Registration eligibility for Mediation I is based on the points allocation process. Enrollment is limited to 15 students per section. Mediation I is offered during Fall and Spring and Summer semesters. Mediation I hours do not count towards your clinical credit cap. Mediation II is a mediation clinic operating in conjunction with the 10th District Alternative Dispute Resolution Program and the Athens-Clarke County Magistrate Court. Mediation II students must successfully complete of Mediation I and register with the GA Office of Dispute Resolution. There are fees associated with registration with the state, and these costs must be paid by the student to the Georgia Office of Dispute Resolution. How do I apply for Mediation II? As noted, Mediation II is only available to students who have successfully completed Mediation I and/or have registered with the Georgia Office of Dispute Resolution to mediate and received approval from the instructor. Up to 8 students may enroll per semester. Mediation II is available Spring, Summer and Fall to eligible students. For more information on court-connected mediation in Georgia and becoming a neutral visit www.godr.org. Listen to Professor Eleanor Lanier give a welcome and introduction to Mediation. "From a 2013 graduate of UGA law, congratulations in advance for your successful completion of 1L or 2L year. 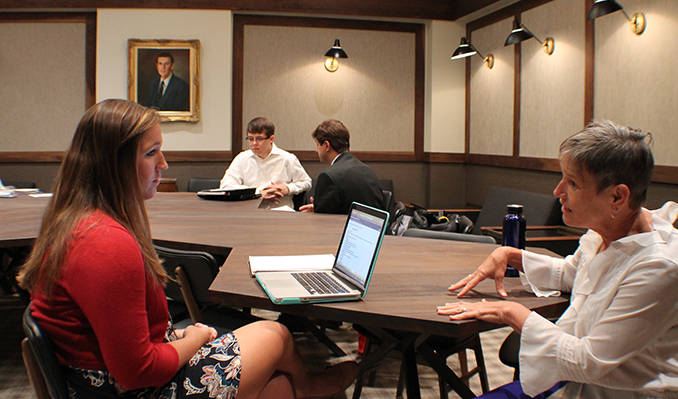 As you consider classes for your 2L or 3L year, I would highly recommend Mediation I and II with Professor Lanier to develop the essential skills that can help you elevate your legal career. From my experience, the practice of law has been more than applications of concepts I learned in law school class rooms. After all, facts of your case, your network, and your reputation will be built upon your interactions with your clients and colleagues. Professor Lanier's instructions in Mediation I and II helped me understand, develop, and practice communication skills that I use in my interactions with my clients and colleagues every day. These skills (e.g., listening carefully, reading body language, and sensing ambience of the conversation) developed through numerous mediations have helped me develop rapport in each interaction and ultimately lead me to my career in NYC. "